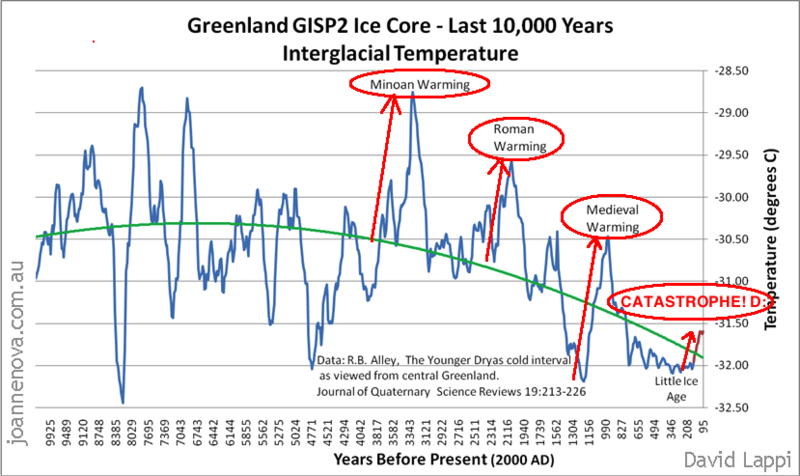 This is likely examining the alleged statement “earth’s temperature has risen to a level that is unprecedented over the past millennium or more” which does not appear to have an official source except science denier web sites. A single sample site to highlight the medieval warming period (MWP) is pretty poor form. This is called “cherry picking” – finding a data set that shows exactly what you want and ignore all contrary evidence and extend your single data set to a wider context beyond what it really explains. Examine ten different reconstructions of the last two thousand years. Mann 2007. Proxy-based reconstructions of hemispheric and global surface temperature variations over the past two millennia. The second graph is usually accompanied with CO2 levels showing the high correlation of CO2 and temperature. Climate4You states “during all four prior interglacials never rose above approximately 290 ppm; whereas the atmospheric CO2 concentration today stands at nearly 390 ppm” which highlights the misunderstanding that they are trying to push about current levels of CO2 which are not yet thermally balanced (incoming heat is greater than outgoing heat), so if we added no more CO2 to the atmosphere right now, we will continue to warm until equilibrium is achieved. The longer time periods are a bit extreme as humans were not around prior to 200,000 years, and this is pushing the same straw man point. Of additional interest may be examining environmental collapses / mass extinctions associated with each dramatic climate change. Knoll 1996. Fossil record supports evidence of impending mass extinction. McLaughlin 2002. Climate change hastens population extinctions. Ward 2005. Abrupt and Gradual Extinction Among Late Permian Land Vertebrates in the Karoo Basin, South Africa. Davis 2005. Evolutionary responses to changing climate. Kiehl 2005. Climate simulation of the latest Permian: Implications for mass extinction. Parmesan 2006. Ecological and evolutionary responses to recent climate change. Mayhew 2008. A long-term association between global temperature and biodiversity, origination and extinction in the fossil record. So climate change does happen, it is devastating on life, and we haven’t warmed as much as we are about to. I fail to see how you’ve clinched the case that AGW is going to be devastating on life, not even speaking of the fact that you haven’t proven that it IS actually man made. On the historical CO2 data, I think you may have ignored the long proven fact that the increase in CO2 actually occurs after the warming not before it. OK, let me help you here. 1. The first graph. You notice how it says “Ice Cores” from “central Greenland”? OK, ice cores are a reconstruction. They have a degree of accuracy, but they are not as accurate as instrument records. So when conducting such an evaluation, don’t use single studies use multiple studies. It will give you a more *probable* result. Here is the results of twelve major studies which cover the period of the single study cited. See, there is some difference, isn’t there? The lesson here is not to cherry pick a single study which satisfies what you want to be true. Now, as for the other two graphs, the first thing that should be mentioned is that they will inevitably be less accurate the further back in in time that reconstructions occur. Proxy data which indicates times in the past which were warmer.Proxy data is commonly taken from astronomical sun spot records for the recent past, dendrochronology for up to ca 10,000 years ago, varve analysis for ca 13 000 years, Beryllium-10 analysis of dust in ice-cores to ca 80,000 years ago, speleothems for ca 500,000 years ago, ice core crystal layers for ca 800,000 years, and oxygen isotope analysis to ca 540,000,000 years. The second point is that it is screamingly obvious that these past temperatures have absolutely no concern at all for contemporary issues. So what if it was eight degrees hotter sixty-five million years ago? That was the age of the dinosaurs! Global warming is occuring and it is significant; a question arises on whether it is caused by human activity. Of this the evidence is very strongly in favour of the latter. Temperature is driven by a variety of sources, primarily solar irradiation, but also greenhouse gases, ozone, volcanic activity, sulphates etc. In the last 100 years greenhouse gases have been responsible for a temperature increase of 0.7 degrees, solar irradiation by 0.2, ozone by about 0.08, volcanics by -0.15 and sulphates by -0.25. Those greenhouse gases are not due to additional natural emissions. Net natural emissions are 0% of the total; human emissions are 100% of the net amount released into the atmosphere (yes, natural processes actually absorb more than they emit). Further, despite a cooling effect of the Pacific Decadal climate pattern and a slight decrease in the last thirty years of solar irradiation, temperatures are still increasing. Scenarios was for a global mean temperature increase of between 1.1 and 6.4 °C have been mapped, variation primarily due to sensitivity in current actions. In a popular and accessible manner, Mark Lynas maps the changes degree-by-degree; the upper end of the scale is utterly catastrophic for our species. Even with current temperature increases the World Health Organization estimates excess deaths due to global warming is already 140,000 people per annum. I think the problem is that quantitatively these measures are blown out of proportion. It is LIKELY that temperatures until 1998 have increased over the course of 100 years. And it is also completely expectable after little ice age. It is also proven, and can be reproduced in isolated experiments that man made greenhouse gases can have some degree of effect on global temperatures, but bear in mind that this is in a completely isolated scenario, and even then the degree to which it contributes to warming is rather little. It’s the “catastrophic” part of the “catastrophic man made global warming” hypothesis that is rather silly to the point where I’m a bit embarrassed for mankind to see people gobble it up so quickly and undoubtingly, since all the boring standard propaganda tools and distortions are at work here that lefties are usually a lot more skeptical towards. Not it is not “likely”. It is a certainty. They are from instrument records, direct testing of temperature, not proxy records. And these records have been subject to extremely strong and verifiable scrutiny (e.g., Berkeley Earth Surface Temperature Project). Not to the extent that has occurred and, has been shown in my previous comments, if it were only up to natural changes temperatures would be declining slightly, not increasing significantly. There are numerous serious predictions which have a good correlation with actual observations (http://www.skepticalscience.com/comparing-global-temperature-predictions.html). 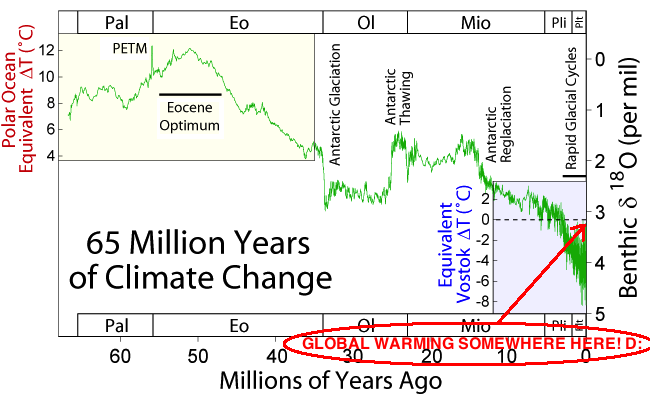 We are currently on target for an A2 change over the century (http://www.skepticalscience.com/iea-co2-emissions-update-2010.html). This is indeed, “catastrophic” in any reasonable use of the word. I think it’s funny how in the link you sent they assume that there is simply one “Measured Temperature”. In particular if you look at recent data that has come out there seems to be lots of evidence that temperatures have now declined pretty much since 1998, effectively displaying an accelerating global cooling trend since then (http://www.c3headlines.com/2011/07/latest-global-temperature-data-confirms-that-unequivocal-global-cooling-is-accelerating.html) which completely contradicts any of the supposedly so reliable predictions in the linked article. Again, I’m not going to claim that any of this data is 100% reliable, I’m just trying to point out how ridiculous it is for any particular group to claim significant certainty about global temperature data. But hey, we can play this game all year long, send each other this or that chart, so in an effort to save you from that boring exercise, I’ll simply give you the benefit of the doubt: Let’s assume all your favored temperature records are 110% accurate, irrefutable and undoubtable and human made warming will be catastrophic: Then the last thing we can possibly do is keep going down the same path of granting the power to regulate emissions to the very people who are amongst the worst polluters and resource wasters on this planet. We should in fact take immediate action and strip them off those powers and allow people who have a vested interest in treating resources prudently to take over in voluntary transactions. Next Next post: Has Hurricane Activity Increased?